Download high resolution image. 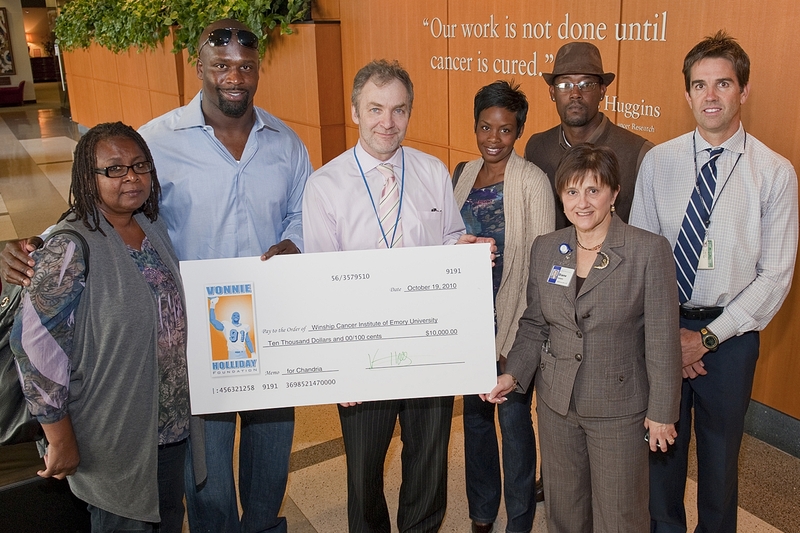 In photo, left to right: Janie Rouse, Chandria's mother; Washington Redskins Defensive End and NFL veteran Vonnie Holliday, Chandria's brother-in-law; Walter J. Curran, Jr., MD, Executive Director of Winship Cancer Institute of Emory University; Eboni Holliday, Chandria's sister; Darrin Kent, Chandria's husband; Diane Cassels, Winship's Executive Administrator; and Timothy Fox, PhD, Director of Emory's Division of Medical Physics. When Chandria Rouse Kent was in her 30s, she was making decisions that few people her age ever have to make. After being diagnosed with a brain tumor at 32, the married mother of one planned carefully for the difficult fight that lay ahead. She fought for five years, finally succumbing to the disease in 2008. Her battle had a profound impact on her family, which includes 13-year NFL veteran and Atlanta resident Vonnie Holliday. As a result, Holliday and his family established The Chandria Rouse Kent Brain Tumor Fund at Winship Cancer Institute of Emory University. “Vonnie’s commitment to this effort, along with his wife Eboni, brother-in-law Darrin, and mother-in-law Janie, has touched all of us,” says Walter J. Curran, Jr., MD, executive director of Winship at Emory. “That Vonnie and his family have decided to bring attention to this underserved area of research funding is humbling to all of us at Winship. They have turned their profound loss into a beacon of hope for other families. Our brain tumor team truly believes that among Chandria’s legacies will be that someday other families may not have to face the tragedy that she and her family faced. To learn more about The Chandria Rouse Kent Brain Tumor Fund and the Emory Brain Tumor Center of Winship Cancer Institute, please call 404-778-5175. The Emory Brain Tumor Center of Winship Cancer Institute is a comprehensive group of multidisciplinary experts in oncology, surgery, neurology, imaging, pathology, rehabilitation and counseling. The Center is the only brain tumor program in Georgia with a neuro-oncologist, neurosurgeons, neuropathologists, neuro-ophthalmologists, neuroradiologists, otolaryngologists and radiation oncologists dedicated to brain tumor diagnosis and treatment. Winship Cancer Institute of Emory University is Georgia's only National Cancer Institute-designated cancer center. Winship is a non-profit, multidisciplinary center dedicated to reducing the burden of cancer in the state of Georgia, the Southeastern region, and the U.S. Winship physicians and other healthcare practitioners serve those impacted by cancer at Emory University Hospital, Emory University Hospital Midtown, the Georgia Cancer Center of Excellence at Grady Memorial Hospital, and the Veterans Affairs Medical Center. For more information, visit winshipcancer.emory.edu. Vonnie Holliday is an NFL defensive end currently signed with the Washington Redskins. During his 13-year NFL career Holliday has played with the Green Bay Packers, Kansas City Chiefs, Miami Dolphins and Denver Broncos. He is known throughout the league as a leader on and off the field. In 2001, he founded The Vonnie Holliday Foundation to improve the quality of life of citizens in underserved communities by donating time and monetary resources. Since its inception, the Foundation has improved the lives of those in many communities. Holliday is determined through the Foundation, to give back to the community that has given him so much and will officially introduce the Atlanta community to his foundation in 2010. Holliday plans to create new programs under the foundation that will benefit families in Atlanta. For more information, visit www.vonniehollidayfoundation.org.